Keystone Camera Little Girl Pink Coat Ad 1958 This is a March 31, 1958 advertisement It is a nice color ad from Keystone Camera Co of Boston. Ad shows a mother taking a movie of her little girl. Little girl is carrying a red purse, walking towards her Mother and holding up a flower she has picked. Doll buggy in the picture also. Nice ad. In excellent condition. Photo is taken through plastic and may show wrinkles or crookedness that is not in the ad. This magazine tear sheet measures 10 1/4"" wide by 14"" tall. 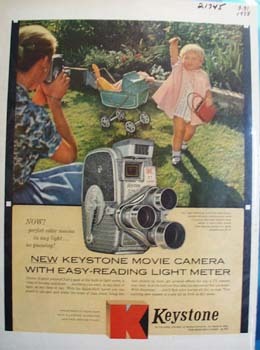 Items Similar To "Keystone Camera Little Girl Pink Coat Ad 1958"